5 Things Technology Can Do, and 7 Things it Can’t. Automation is more and more important in today’s patient financial services office. Shrinking margins dictate smaller teams, while the complexity of achieving reimbursement only increases. In that environment, being able to rely on advanced, highly-automated technology is essential for your efficiency…and your sanity. Programmatically examine claims prepared in the EHR batch file and execute proactive inquiries to the Medicare online system or the various state Medicaid online systems to verify exact beneficiary name (important for Medicare reimbursement) and coverage details. Automatically generate secondary claims based on remittance data for the primary claims, populating all COB fields as needed, AND setting that automated secondary claim to a future release date if the payer issued the remittance with a post-dated check date. Systematically populate provider numbers corresponding to physician names from a cross-reference table when new credentials are approved but not yet integrated into the EHR. Automatically complete missing data based on specific rules to overcome EHR shortcomings; for example, copying the patient address to primary insured address when patient relationship code equals 01. Immediately identify denials (both line-item and full claim) on electronic remittance advice and add them to the denials workflow along with the original claim, full tracking, and EOB for prompt and easy handling. Persistently work with another claims gateway organization to change an edit so that claims required to pass through that clearinghouse for a particular payer will not be stopped or delayed unnecessarily. Observe client-specific challenges firsthand and assist with creatively developing tactics to overcome unique obstacles, such as those associated with staffing fluctuations or transitions in your leadership team. Receive feedback on product functionality, bringing enhancement requests to the appropriate individuals in our organization to ensure they are heard and understood. Bond with you and your team as individuals over shared interests; understand your life and offer empathy as well as cheers. Join you in a call with a payer or with an EHR representative to provide reinforcement and additional information, if necessary, when you explain a difficulty you’re experiencing and what they need to do to address it. Assist you and your staff to make the best use of new system features, and promote confidence as you develop new skills, or establish new protocols to take advantage of technological efficiencies. Be another set of eyes on a tricky situation; offer application shortcuts; share insights gained from working with other clients on similar challenges. Technology is great. Quadax products are replete with opportunities for creating efficiencies with automated rules-based processing to reduce your costs and increase your cash flow. However, the personal support that Quadax also provides is unique in the industry and makes all the difference. Regardless of the potential for revenue cycle gains associated with conversion to a high-performance clearinghouse, a revenue cycle leader may encounter obstacles to making a switch. 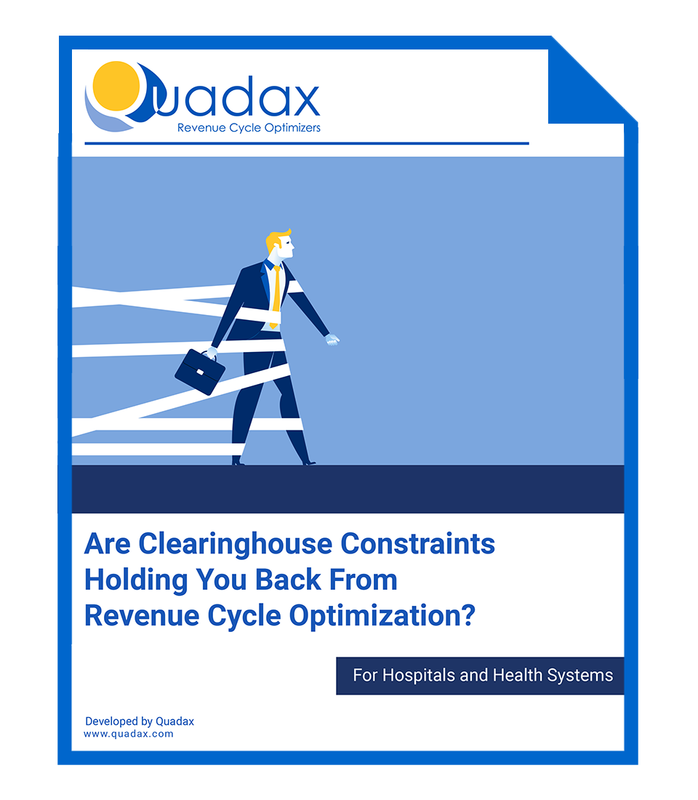 Learn more about common conversion concerns and how to overcome them in our white paper titled Are Clearinghouse Constraints Holding You Back? The Quadax model of superior technology plus personalized, consultative support is designed to build partnership and move you from revenue cycle so-so to revenue cycle success! It begins with a thorough, customized implementation process. 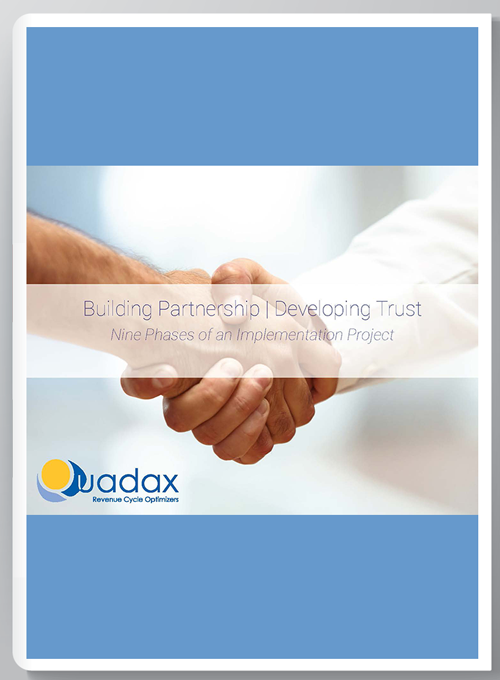 Read about the 9 phases of a clearinghouse implementation project in our e-book titled Building Partnership | Developing Trust. Quadax people make the difference, and we’d be happy to talk with you about the challenges you’re facing. Find out more about the Quadax difference and learn what that can mean for your organization!